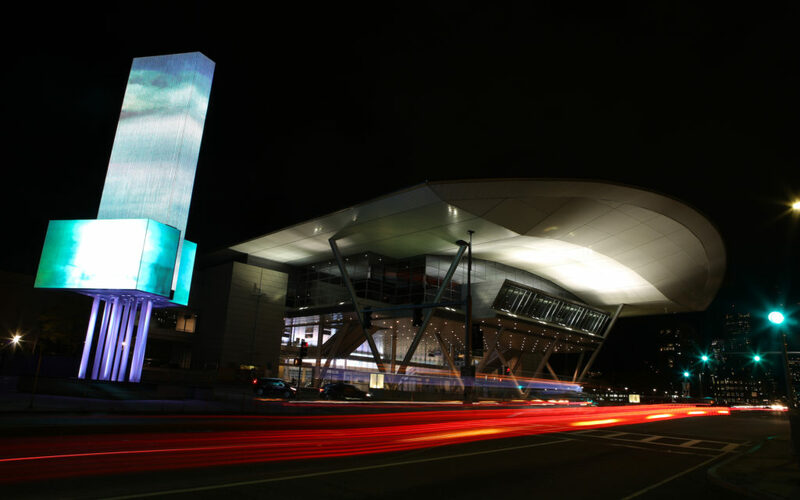 Boston Cyberarts, Inc. and the Massachusetts Convention Center Authority (MCCA) have worked for almost five years to display the talent of local artists on the largest urban screen in New England. “Round 19” of “Art on the Marquee,” an exhibit that features nine pieces of art by nine different artists on an 80-feet tall multi-screen LED marquee at the Boston Convention & Exhibition Center in South Boston, opened on Oct. 25. The opening night highlighted the artwork by cycling through all nine pieces without interruptions from paid advertisements or public service announcements. The artists specialize in different styles, but this variety creates a more interactive exhibit. Although some rounds have themes, which create a more cohesive style, the current round – which features moving imagery of water, air and people – has no particular set theme. George Fifield, director of the non-profit organization Boston Cyberarts, made rounds on opening night to discuss the exhibit with artists and viewers over small appetizers and sundaes. The lofty art features movements and colors that catch and hold the attention of onlookers. The artists were chosen via jury panel, rather than by Fifield, as some have been in the past. The jury panel typically involves members of both the MCCA and Boston Cyberarts. The MCCA has multiple convention centers through which a community arts program cycles. The Marquee is located in an area through which thousands of Boston residents and commuters traffic to and from work. The art draws attention for both its size and the dynamic movements on the Marquee. The nine features include “My Three Sided Moon” by Sarah Brophy, “The Waters of Life: A Refuge” by Justin Freed and “Greenland Ittoqqortoormiit,” a collaboration between Ellen Wetmore and Adriene Hughes. Jon Forsyth, creator of “Aquarium Dreams,” teaches music video production in Valencia, Spain for six months every year. Fifield believes that such displays are the future of public art.